Review of Dogfish Head Theobroma | Beer Apprentice - Craft Beer News, Reviews, Interviews and Info. Hello again guys. Thanks for checking in on another craft beer review. For today’s beer I’m going to be sampling the Dogfish Head Theobroma produced by the Dogfish Head Craft Brewery located in Milton, Delaware. I’ve never had this brew before, so I’m really looking forward to trying this creative concoction. Let’s look it up on the brewers website, dogfish.com, and see what we can find out about it. The discovery of this beverage pushed back the earliest use of cocoa for human consumption more than 500 years to 1,200 B.C. As per the analysis, Dogfish Head’s Theobroma (translated into “food of the gods”) is brewed with Aztec cocoa powder and cocoa nibs (from our friends at Askinosie Chocolate), honey, chilies and annatto (fragrant tree seeds). Sounds pretty crazy. Let’s try it. This particular Dogfish brew comes in at 9.0% ABV and in a 25.4 oz. vessel. The beer poured a cloudy/hazy, golden to orange color. The head was barely off white, of decent size and kind of soapy and fizzy. The retention time seemed adequate and the lacing didn’t look too bad either. Not a whole lot was there, but I didn’t expect a whole lot considering the higher ABV. Some alcohol feet were noticed on the glass as I tilted it from side to side also. The nose was very complex and lively. I definitely got hints of the chili peppers along with the undertones of honey. I didn’t find much of the cocoa powder or chocolate though. Touches of light fruit along the lines of pear and maybe even some white grapes. I also noticed some toasted breadiness, herbal qualities and clean grains, but the chilies and spices led the way on the aroma that’s for sure. The chilies and other assorted spices were also the first thing I noticed with the taste. They were followed by a light alcohol savor as well as some toasted breadiness. The fruitiness seemed a lot more relaxed than it did in the fragrance. As the brew warmed I began to pick up on the subtleties of the chocolate as well as a tad of earthiness. They never really became a defining factor I didn’t think, although they was noticed. All of the characteristics and ingredients are so attenuated and harmonized that I was having trouble distinguishing all that was going on here. It’s a very nice flavor, but my palate may be a touch immature to completely appreciate all that this beer entailed. The mouthfeel was medium bodied, relatively smooth, dry, slightly snappy and lightly crisp. It finished clean with a good amount of heat from both the alcohol and the chilies. It maintained good carbonation throughout the drink and a good dose of flavor was left behind on the palate between sips. I’ll tell ya. This is one of the more complex brews that I’ve ever had. I think it’s worth a try just for the sheer dissimilarity in which it separates itself from other beers. I liked it. I wouldn’t say that’s it’s the best brew that I’ve ever had, however it’s pretty darn good. As I went along I began to enjoy it more and more with each sip. I don’t think that I could drink it everyday nor would I want too, but if you are looking for an “off the wall” kind of brew… this may be what you would need to pick up. Like I said before, my nose and palate may not be advanced enough to comprehend all that I’m smelling or tasting, but yours may be. 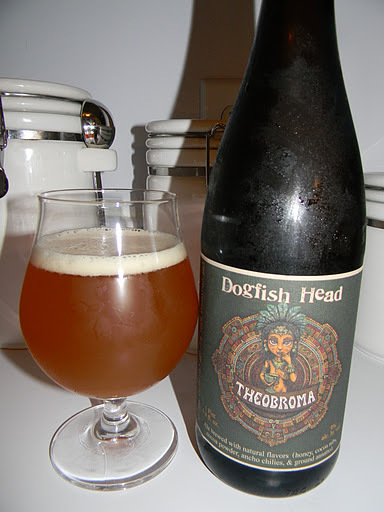 So, pick up a bottle of the Dogfish Head Theobroma and give it a test drive. Be sure to let me know what you thought of it too. As always, thanks for reading and commenting folks. I really appreciate it. I love how DFH is not afraid to push the boundaries for beer. If you ever make it to NYC, you should check out a place called Birerria. DFH makes special brews in house to go with their menu. Their pumpkin ale last fall was divine!! Thanks for reading and commenting. I would love to go to New York City and check out Birerria. I think that would be an awesome experience. I'm sure those brews are super fresh and tasty. I had this the other night on draft. I wasn't that impressed. Dogfish Head has been dropping the ball lately. Their 60, 90, and 120 are incredible… but when they start reaching and trying new things, especially beers this big and only available in bombers… I need to be hesitant. I liked the aroma, and got more chili in the aroma than I did in the flavor. But for a beer that is classified as a chile beer… I expected more chili. Not that I wanted it to taste like the chili beer from Cave Creek… but something close. More heat. Unless, of course, there is a difference between chile with an e and chili with an i. Do you know? Anyway, thanks for sharing your thoughts on this massive beer from one of the best breweries on the east coast. Bottoms up! Dude, I have no idea if there is a difference. I did like the beer ok though. I'm kind of like you in the regard that Dogfish does produce some beers that I really, really like and then there are some that I don't find myself being overly enthusiastic about. Oh well, just different palates I guess. I still like the brewery very much though and will continue to try all the experiementals they produce if I can get my hands on them.